igus has introduced a low-cost robot that can help small and medium sized businesses get introduced to automation for an initial investment that is far less than units currently being used in manufacturing industries . The delta robot provides a thrifty and simple automation solution for assembly tasks. 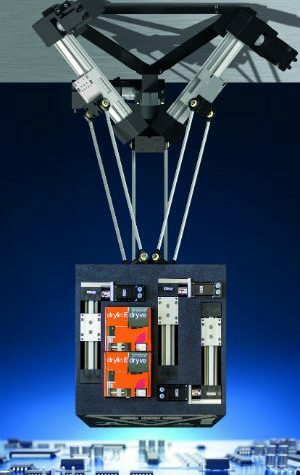 The low-maintenance, lightweight robotic assembly is manufactured entirely with igus components, and units start at $6,200. Automated units that complete similar tasks usually cost between $20,000-$30,000. The delta robot was presented at the 2018 automatica convention in Munich. The robot is based on three maintenance-free drylin® ZLW toothed-belt actuators, lubrication-free igubal spherical bearings and other lightweight components. NEMA stepper motors and encoders ensure quick handling by the delta robot of up to ± 0.5 millimeters. The complete system has an installation space of up to 420 millimeters in diameter and can carry up to five kilograms at low speeds. The unit is constructed with aluminum and plastic materials, and reaches a maximum pick rate of 60 per minute. The unit weighs 15 kilograms, has a working area diameter of 380 millimeters (at 75mm) and a maximum process force of 100 N ( a radius of 0 millimeters). The delta robot costs between $6,200-$8,850 depending on the assembly and controller package, according to Mowry. Depending on the customer’s requirements, the delta robot can be delivered pre-assembled within 24 hours as a ready-to-install system in a transport frame or as a kit with quick and easy assembly instructions. As an option, customers can use their own software and control system, or the intuitive and easy-to-use dryve D1 control system. In addition to the delta robot, igus also offers further low-cost robotics systems with its robolink product range. This range offers the user the opportunity to individually assemble robot arms with up to five axes from a modular system consisting of different joints with a wide variety of durable plastic gears, motors and interface connectors.